todays i'll introduce you to 100% organic and natural cosmetic known as Natures Brilliance by Sue which is owned by Susan Skoczypiec who has worked for 34 years as Police Administrative Secretary. She has a Diploma in both Holistic Beauty Therapy and Holistic Herbal Therapy; with Certificates in Reflexology, Aromatherapy, Bach Flower Remedies, Crystal Healing, and Business Development for the Alternative Health Therapist, from the Natural Health Institutes, based in Canada. The Website claims "Nature's Brilliance By Sue will not sell any product that is not 100% Natural or Organic and has not been tested by the owner her self"
I really like the products she sent me, i got four foundation samples, Mineral Eye Colors - Samples , Mineral Color Set, Regular Mineral Eye Colours. Susan is the right shade for me and Destiny covers my under eye area well. 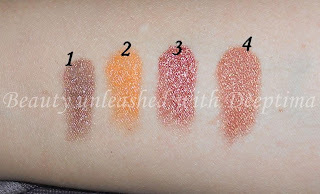 All the colours are nicely pigmented and they spread like cream.. The lipstick is very very moisturizing, all the natural and essential oils make your lips soft and supple with a pink tint. What i dnt like about the lipstick is that its very very soft and creamy if i dont keep it in the refrigerator it gets all wiggly, so i might transfer it in a pot or something, i use it as lip balm and its great for daytime specially for going to classes and protect your lips from getting dry. I Hope you like the Review, please leave your lovely comments below. talk to you soon !! These look so vibrant!! Now I am waiting for your EOTD video!! Will do tht soon Nivedita, will be putting some before and after pics for foundation in next post ! the colors are soo pretty!! wow! those are some fab colors. nice pigmentation! the eyeshadows seem to have amazing pigmentation, in fact the lipstick looks a riotous coral but it looks very natural on the lips.Like it! these colors looks so beautiful and pigmented. I gotta try them out! thank you Mavi.. love ur picture.. <3 following your blog too ! !